Offering a safe haven from both the weather and the hustle and bustle of modern life, Grace Neill's is the perfect spot for some award winning food, a welcome drink with friends or some old-world character and charm to feed the imagination.Grace Neill’s has been listed in the Guinness Book of Records as being ‘Ireland’s Oldest Pub’, and we’re thrilled to carry on the tradition of serving a warm welcome and hearty hospitality to this day. 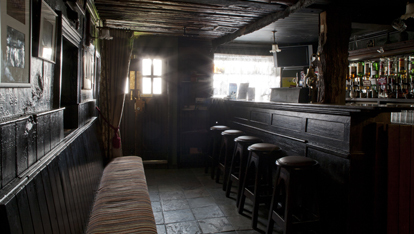 Clocking in at an impressive 400 years old (it’s listed in the Guinness Book of Records as “the oldest pub in Ireland”), it’s no surprise that Grace Neill’s in the town of Donaghadee, County Down, is home to a ghost or two. So renowned are the ghosts in Neill’s that the pub has been visited by paranormal TV crews and ghost hunters. It has even hosted séances down through the years. Ghostly fun aside, the vibe here is cozy traditional. Good times have been enjoyed by more than just ghosts, too: author Daniel Defoe, composer Franz List and even Peter The Great of Russia have taken a tipple at the bar.